So, you’re looking for a 1920s band? First of all, we doff our caps to you and your great taste. No era can rival the roaring twenties for its musical bravura and infectious passion. Whether you’re planning a wedding, party or corporate event, a live band is an unbeatable way to encourage guests to let their hair down. However, while the genre of entertainment is a no-brainer, choosing an act isn’t quite as straightforward. Hiring a 1920s band isn’t like reserving a table in a restaurant or booking a seat in the cinema. High star ratings online will provide some assurance that a band are capable of getting the room into a bit of a groove, but for a really rewarding performance that offers an experience, you need to look a little deeper. Don’t worry, though. You won’t need to get out a pen and pad and scribble down a list of band criteria. We’ve done all the work for you! Here’s our razzle-dazzle guide to hiring a 1920s band and the five things you’ll need to consider when you book. The very best bands don’t just know how to play – they know how to read a room. Every party has a different vibe, from a wedding reception, to a celebratory shindig, to a boisterous birthday bonanza. Perhaps you need a 1920s band for an event that isn’t really a party at all? The music of the twenties has a sweet, soothing side as well as an uproarious one, and the former style is obviously far more appropriate for events like funeral ceremonies and wakes. 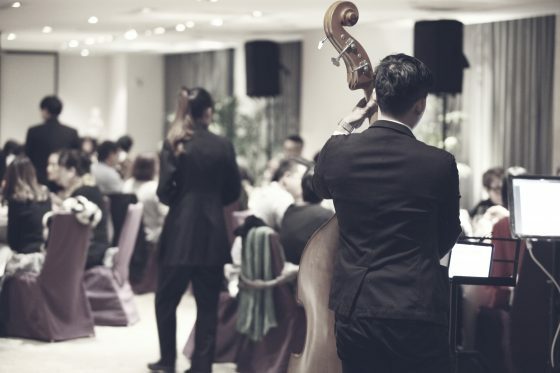 A band’s routine needs to fit in with the vibe of the event, and it’s imperative to ensure the musical group you hire can cater for the occasion. Whatever the reason for your get together, you can rely on The Jazz Spivs to do just that. We have been headlining and performing at a wide variety of different functions for years, and know exactly how to tune our instruments and set list to fit in with the atmosphere. It’s also important to consider the theme of the event before you put down a deposit on a 1920s band. For example, what sort of look and feel are you going for? An extravagant celebration like those hosted by a certain Mr Gatsby? A speak-easy style soirée? A low-key gathering where the band offer easy-mingling music rather than standing in as stars of the show? The Jazz Spivs have performed at hundreds of parties and events with a variety of different themes, including all the examples listed above and many, many more. Versatility is a treasured attribute in a 1920s band, and we’re proud to declare we have it in abundance. From our eclectic wardrobe to our extensive musical repertoire, blending in brilliantly is what The Jazz Spivs do best. If you’d like to know more about the parties we’ve played at and how we can mould our performance to suit your theme, simply get in touch with the team! As we mentioned earlier, checking out a few online reviews of bands across social media and forums is a good way of gauging whether a group can give a great performance. But in order to confirm that they can deliver the goods consistently, it’s worth scouring the web for videos of their shows and for testimonials written by people in the know. In all our years performing, The Jazz Spivs have built a terrific reputation nationwide. We have been blessed with some rave reviews by people from all walks of life at a huge variety of events, and we receive a great deal of bookings through positive word of mouth. When you reserve a front seat with The Jazz Spivs, you’ll get a renowned 1920s band with an esteemed reputation and accreditation by the Federation of Small Businesses. Every single one of our performances is fuelled by a genuine sense of pride and passion. This isn’t some side gig for an extra bit of cash. This is our livelihood, our dream, and what we were born to do. That’s the kind of band you deserve and need at your event. A big mistake people can often make when hiring a 1920s band is forgetting to ask about the tools and equipment the performers will bring along. Remember, there’s no absolute definition of a prohibition era band. We all have our own ideas about what a 1920s ensemble looks and sounds like, with our thoughts shaped by the particular monochrome movies we’ve seen and the stories we’ve heard. The point is – if you simply assume that a band will bring along a giant brass horn or a snazzy drum set, you could end up being disappointed. That’s why it’s important to hire a 1920s band with an instrument set diverse enough to rival Louis Armstrong and His Hot Five. The Jazz Spivs are that band. We have a massive assortment of instruments and a huge range of equipment – all of which is fully PAT tested and certified. We also have our own Public Liability Insurance to the value of £5 million, and offer a comprehensive risk assessment on request at any time to guarantee everyone’s safety and security. There’s a lot to consider when you hire a 1920s band, but you can rely on The Jazz Spivs to tick each and every box. We’re not being boastful when we tell you that we’re the complete package – we just know what our clients need and can cater for them accordingly. We’re happy to tailor our performance to your requests right from the off, and will do our utmost to make your event a memorable one for all the right reasons. Simply get in touch with us today using our contact form for booking information, or give us a jingle on 0800 756 5512. We’ll be happy to answer any questions you may have.